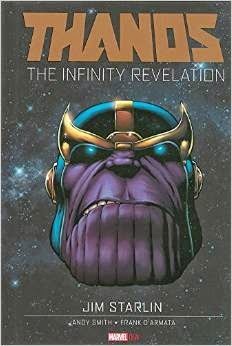 I could talk for hours about how much I like Jim Starlin’s work so I was very excited to see the publication of his Thanos graphic novel. If I heard correctly, this is the first of three. Starlin’s art is just as good, or better, than it was in his heyday of “Captain Marvel”, “Warlock”, “Metamorphosis Odyssey”, and “Dreadstar”. The inker perfectly complements his line work without changing the style. It was fun getting to revisit the cosmic corner of the Marvel universe. Where else have we got to see Infinity, Eternity, and the others in recent years? I was hoping to see them in Marvel’s big “Original Sin” crossover but it does not appear to be in the cards. Starlin’s Steve Ditko inspired landscapes perfectly illustrate the big characters. If the story has a fault it is in the lack of a resolution. Instead of a standalone novel, this seems like chapter one of a three part story. Despite that reservation, I highly recommend you taking the plunge into the cosmic epic as depicted by Starlin. Now I am going back just to stare at the pages.